In this article we'll explore how the flipped classroom approach may benefit families and children in your school's or parish's education program, including opportunities for intergenerational catechesis and more dedicated class time for students to explore and discuss their Catholic faith. Download available in English and Spanish. 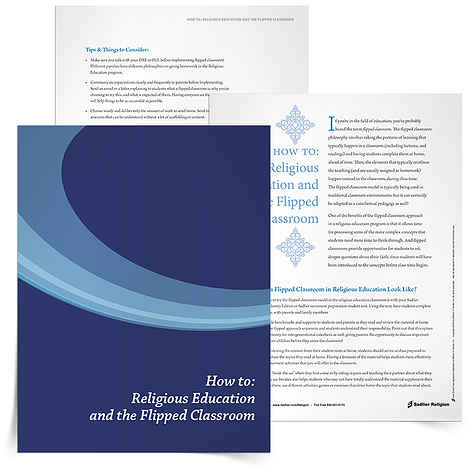 Download the How To: Religious Education and the Flipped Classroom eBook now! If you’re in the field of education, you’ve probably heard the term flipped classroom. The flipped classroom philosophy involves taking the portions of learning that typically happen in a classroom (think of the content from lectures and readings) and having students complete them at home, ahead of class time. Class time is then spent reinforcing the content that students have read and reviewed before class (think activities, discussion, and projects). In other words, what is typically completed as classwork is homework preceding class, and what is typically assigned as homework, is classwork! You’d be more likely to see a flipped classroom model being implemented in a tradition classroom with an academic subject. However, this approach can certainly be adapted as a catechetical pedagogy as well! The flipped classroom approach may offer some key benefits to the families and children in your Catholic religious education program, including opportunities for intergenerational catechesis and more dedicated class time for students to explore and discuss their Catholic faith. The model also presents an opportunity to increase your connection and engagement with families as you ask them to be partners in the catechetical process. Finally, the approach really lends itself to the use of rich multimedia resources, including robust video and audio, that helps to teach as it engages families. Download a How To: Religious Education and the Flipped Classroom eBook that further explains the flipped classroom model and provides instructions on how to give it a try in your religious education program using your Sadlier program. The eBook discusses the benefits and potential challenges of this approach and includes tips and tricks for implementation. If you’re considering implementing a flipped classroom model in your Catholic religious education program, you may want to download additional resources designed to help support families. Enrich the catechesis of children by encouraging family prayer with this helpful support article, Prayer: Helping Children and Families to Pray Support Article. Also, download and share the Passing on the Faith Takes Collaboration Support Article that highlights why and how all of Jesus' disciples must work together to pass on the faith! Finally, aspects of both We Believe and Creemos can be accessed, printed, or viewed on a mobile device or tablet and can be a big help to families who are using the student text at home in a flipped classroom approach. Visit Sadlier Connect. The flipped classroom is an instructional strategy in which the typical lecture and homework elements of a course reversed. Class time is then spent reinforcing the content that students have read and reviewed before class. 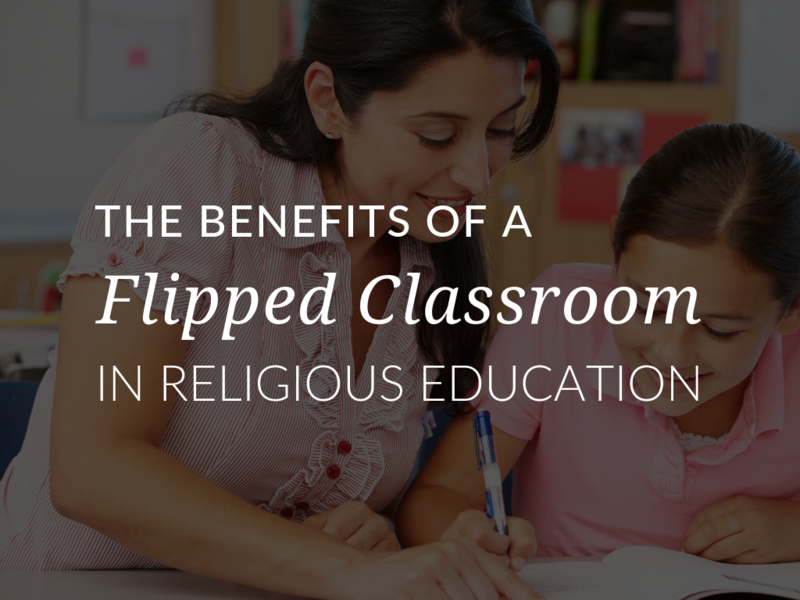 Have you implemented flipped classroom in your Catholic religious education program? What have you found to work? What has proved difficult? We’d love to hear your experiences with this model!